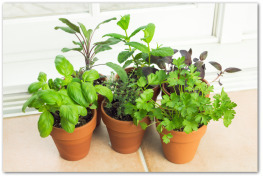 Here are a few great tips for growing herbs indoors, outdoors, and in container herb gardens. 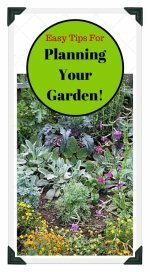 Learn how easy it is to plant and care for herbs when home gardening. 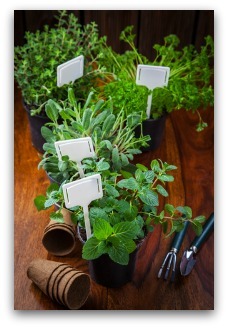 Plant a kitchen herb garden to supply fresh herbs to spice up your meals! 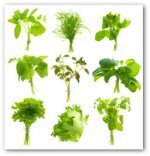 Why Grow an Herb Garden? 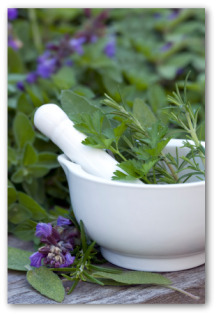 The practice of planting herbs has been undertaken on every continent for hundreds of years. Herbs are prized for their scents, medicinal properties, and seasoning qualities in gardening, aromatherapy, arts and crafts, home remedies, and cooking. 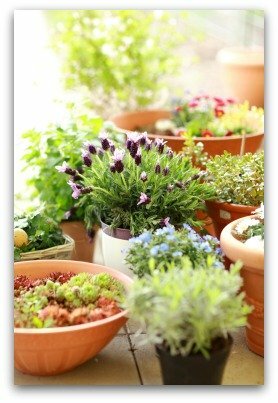 Planting a small sized kitchen herb garden supplies a wide range of flavorful, therapeutic, and fragrant herbs. 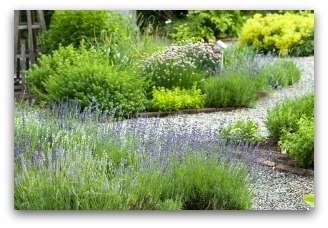 Visiting herb gardens is the best way to decide on which plants to select and where to place your garden. There are bed designs for growing herbs such as a cook's garden of basic culinary herbs, a formally arranged medicinal uses border, or a collection of colorful herbs in cottage garden style. 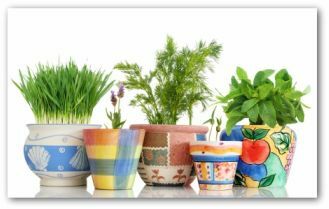 Many herbs can be successfully grown indoors in a container herb garden. Choose a sunny windowsill to arrange your containers. If needed, use a grow light to provide full-spectrum light. As with most indoor plants, over-watering can be a bigger problem than under-watering. Be sure that your containers have adequate drainage. Don't let the pots sit in water with one exception: if the soil in your containers drys out completely, place the container in a small dish of water, and set a timer for 10 minutes. This will allow the dry soil to re-absorb water. Feed liquid fertilizer every 2 weeks.Harvest herbs by pinching off the tips of the plants. This encourages bushy plant growth. The space requirements and growth habits of your plants must come first when deciding on which herbs to grow. For instance, in a small bed there will not be adequate space to cultivate a woodland herb such as loveage or angelica. These majestic herb plants would dominate the other plants and appear hopelessly out of scale. Geometric patterns can be created when growing herbs by using evergreen perennials with similar heights and growth rates. Keep in mind when selecting the plants for your herb garden that some herbs are very picky about the soil where they are grown. On the other hand, there are herbs that can adapt practically to any conditions. For example, rosemary thrives basically anywhere except in cold winters. It is a good idea to begin fitting in the plants with a few herbs to start that you know you will use and add others later. Ask neighbors for advice on which plants thrive in your particular location. Essential culinary herbs can be planted together in the vegetable garden or individual plants may be tucked into existing beds and borders. Many popular choices of growing herbs can be fitted comfortably in a bed sized about 10 x 3 feet. Confine annuals and invasive type herbs to containers. 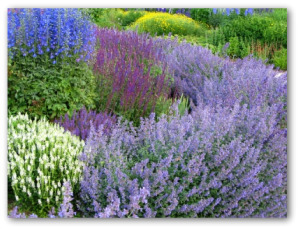 Enclosing the bed with a hedge of evergreens permits the addition of hyssop, germander, lavender, and similar growing herbs. At the base of your herb garden, dwarf herb varieties such as pennyroyal and woolly thyme can be allowed to grow over the edge of the garden path. 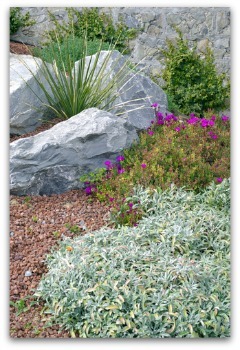 As your ambitions extend farther, a dry bank is the ideal site for planting a grouping of thymes. An arrangement of decorative pots in a courtyard could house mint that prefers partial shade or basil which requires full sun. Cottage garden herbs include the classic culinary growing herbs like parsley and sage, perhaps with the addition of coriander, garlic, and curry plant. 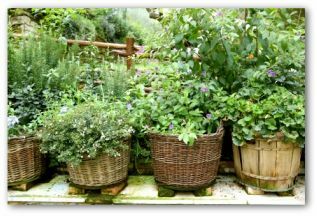 An herb garden grown in containers can be the perfect solution for small spaces. Herb container gardens can be a convenient way to grow kitchen herbs where you can see them, and have quick access when preparing a meal. 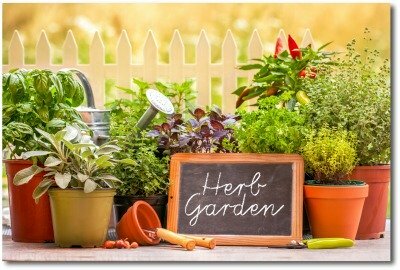 Almost any type or size of container can be successfully used when growing an herb garden. Fill the containers with high-quality potting soil, and fertilize every 2 weeks during the growing season with liquid plant fertilizer. 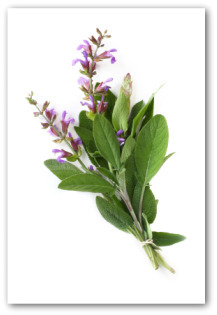 Harvest herbs by pinching off the tips of the plant for use in the kitchen. This will encourage new plant growth, and help keep the plant more compact. 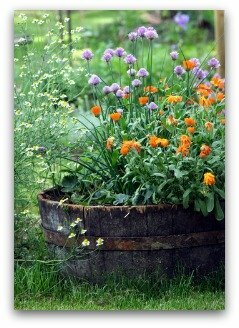 Sow pinches of dill, borage, and marigold seeds in containers for use when gaps appear in your garden. Add young marjoram, savory, and feverfew plants to the edgings of other low perennials. Potted mints such as ginger and pineapple mint may be set into the soil, with the pots buried up to their rims, for filling in gardening spaces with their decorative seasonal foliage. In Tudor times, gardeners translated embroidery and plaster ceiling patterns into floral designs for the garden. This formal garden layout has its advantages such as making the plants easier to reach for maintenance and harvesting. The design can be simple when growing herbs. For example, there is the familiar fan or cartwheel; wedge-shaped beds radiating from a common center. The geometric shape could be in a checkerboard arrangement of alternate types of herbs planted in square beds. 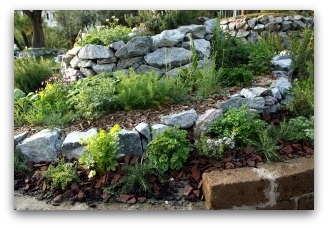 A French style potager garden of vegetables and salad herbs may be the most effective for smaller sized gardens.